The Gulls make summery music – but not the kind of contrived summery music that might find itself out of place on the cool beaches of Cape Cod or Boston’s North shore. Far from trying to cop the Hawaii/SoCal vibe of a Jack Johnson type, the Gulls show their New England roots indirectly through their sound. The Gulls’ sound is simple. They make honest, straightforward, acoustic-tinged rock, at times folkish, and always catchy and accessible. Their second full length album, Cabana, floats by breezily, with ten quick tracks that maintain a very consistent vibe. The songs portray the chops of veteran writers, with enough of the variety and imperfection that makes them a truly “chill” band. The Gulls fall into the category of musicians that make music that they themselves like, for an audience of people who share their interests, in hopes they will like it too. It’s polished enough to be almost mainstream-ready, but until that day comes and they become the new Guster, it still sounds like your friend’s friend’s band that is playing at some beach bar somewhere in Rhode Island, that nobody except the most cold-hearted snob could turn down checking out. 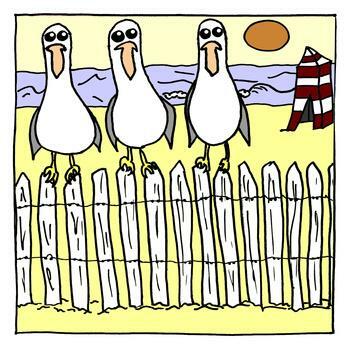 The Gulls make fun, honest, happy music, for fun, honest, happy people. If that sounds like you, give Cabana a spin.